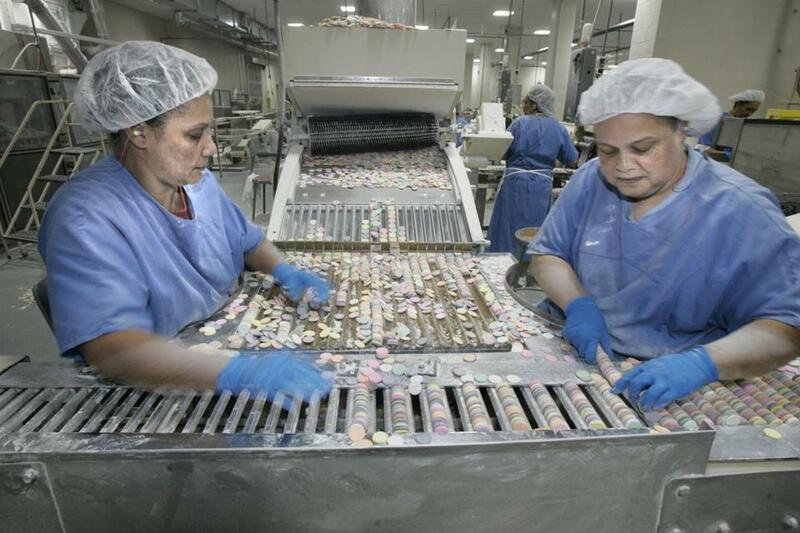 Teresa Barbosa (left) and Carolyn DeGraffenreid processed wafers at the Necco factory floor in Revere. It’s the industrial version of gentrification: GE takes over a former Necco candy factory for its new Boston headquarters, and Novartis occupies the old Necco plant in Cambridge. Necco moved to cheaper digs in Revere. But now, changes are coming to that site, too. The Revere City Council will discuss Monday a zoning amendment so the 50-plus acre industrial property can be used for life sciences, robotics, or advanced manufacturing. Necco is still in the 830,000-square-foot building there. But the candy company recently exited at least 200,000 square feet, and its lease for the rest is up next summer. Atlantic Management and VMD Companies bought the site this year for nearly $55 million. The new owners don’t seem to envision the highest and best use to be churning out candy hearts. Atlantic chief executive Joseph Zink says his firm is talking with Necco about sticking around, but he also expects to ramp up marketing for the property this fall. Prime industrial land this close to Boston should be a hot commodity. It will be interesting to see what Zink and his team can pull off, particularly with Tom O’Brien redeveloping Suffolk Downs and the efforts to sell the shuttered Wonderland dog track. Reviving the Necco property could be crucial for Mayor Brian Arrigo. Revere once relied heavily on racetrack jobs. Now, those are all but gone. Necco remains Revere’s largest employer. But when your No. 2 and No. 3 biggest employers are a Stop & Shop and a movie theater, your city is long overdue for new blood. Zink hopes to be the one to provide it.